Isopropyl alcohol (IUPAC name propan-2-ol), also called isopropanol or dimethyl carbinol, is a compound with the chemical formula C3H8O or C3H7OH or CH3CHOHCH3 (sometimes represented as i-PrOH). It is a colorless, flammable chemical compound with a strong odor. As a propyl group linked to a hydroxyl group, it is the simplest example of a secondary alcohol, where the alcohol carbon atom is attached to two other carbon atoms, sometimes shown as (CH3)2CHOH. It is a structural isomer of 1-propanol. It has a wide variety of industrial and household uses. Isopropyl alcohol is miscible in water, ethanol, ether, and chloroform. It will dissolve ethyl cellulose, polyvinyl butyral, many oils, alkaloids, gums and natural resins. Unlike ethanol or methanol, isopropyl alcohol is not miscible with salt solutions and can be separated from aqueous solutions by adding a salt such as sodium chloride. The process is colloquially called salting out, and causes concentrated isopropyl alcohol to separate into a distinct layer. Isopropyl alcohol forms an azeotrope with water, which gives a boiling point of 80.37 °C (176.67 °F) and a composition of 87.7 wt% (91 vol%) isopropyl alcohol. Water-isopropyl alcohol mixtures have depressed melting points. It has a slightly bitter taste, and is not safe to drink. Isopropyl alcohol becomes increasingly viscous with decreasing temperature and freezes at −89 °C (−128 °F). Isopropyl alcohol has a maximum absorbance at 205 nm in an ultraviolet-visible spectrum. Isopropyl alcohol is often used as both solvent and hydride source in the Meerwein-Ponndorf-Verley reduction and other transfer hydrogenation reactions. Isopropyl alcohol may be converted to 2-bromopropane using phosphorus tribromide, or dehydrated to propene by heating with sulfuric acid. Like most alcohols, isopropyl alcohol reacts with active metals such as potassium to form alkoxides that can be called isopropoxides. The reaction with aluminium (initiated by a trace of mercury) is used to prepare the catalyst aluminium isopropoxide. In 1994, 1.5 million tonnes of isopropyl alcohol was produced in the United States, Europe, and Japan. This compound is primarily produced by combining water and propene in a hydration reaction. It is also produced by hydrogenating acetone. There are two routes for the hydration process: indirect hydration using the sulfuric acid process, and direct hydration. The former process, which can use low-quality propene, predominates in the USA while the latter process, which requires high-purity propene, is more commonly used in Europe. These processes give predominantly isopropyl alcohol rather than 1-propanol because the addition of water or sulfuric acid to propene follows Markovnikov's rule. The indirect process reacts propene with sulfuric acid to form a mixture of sulfate esters. Subsequent hydrolysis of these esters by steam produces isopropyl alcohol, which is distilled. Diisopropyl ether is a significant by-product of this process; it is recycled back to the process and hydrolyzed to give the desired product. Direct hydration reacts propene and water, either in gas phase or in liquid phase, at high pressures in the presence of solid or supported acidic catalysts. Higher-purity propylene (> 90%) tends to be required for this type of process. Both processes require that the isopropyl alcohol be separated from water and other by-products by distillation. Isopropyl alcohol and water form an azeotrope and simple distillation gives a material that is 87.9% by weight isopropyl alcohol and 12.1% by weight water. Pure (anhydrous) isopropyl alcohol is made by azeotropic distillation of the wet isopropyl alcohol using either diisopropyl ether or cyclohexane as azeotroping agents. Crude acetone is hydrogenated in the liquid phase over Raney nickel or a mixture of copper and chromium oxide to give isopropyl alcohol. This process is useful when coupled with excess acetone production, such as the cumene process. In 1990, 45 thousand tonnes of isopropyl alcohol were used in the United States. The vast majority of isopropyl alcohol was used as a solvent for coatings or for industrial processes. In that year, 5.4 thousand tonnes were consumed for household use and in personal care products. Isopropyl alcohol in particular is popular for pharmaceutical applications, it is presumed due to the low toxicity of any residues. Some isopropyl alcohol is used as a chemical intermediate. Isopropyl alcohol may be converted to acetone, but the cumene process is more significant. It is also used as a gasoline additive. Isopropyl alcohol dissolves a wide range of non-polar compounds. It also evaporates quickly, leaves nearly zero oil traces, compared to ethanol, and is relatively non-toxic, compared to alternative solvents. Thus, it is used widely as a solvent and as a cleaning fluid, especially for dissolving oils. Together with ethanol, n-butanol, and methanol, it belongs to the group of alcohol solvents, about 6.4 million tonnes of which were utilized worldwide in 2011. Examples of this application include cleaning electronic devices such as contact pins (like those on ROM cartridges), magnetic tape and disk heads (such as those in audio and video tape recorders and floppy disk drives), the lenses of lasers in optical disc drives (e.g., CD, DVD) and removing thermal paste from heatsinks and IC packages (such as CPUs). Isopropyl alcohol is esterified to give isopropyl acetate, another solvent. It reacts with carbon disulfide and sodium hydroxide to give sodium isopropylxanthate, a herbicide and an ore flotation reagent. Isopropyl alcohol reacts with titanium tetrachloride and aluminium metal to give titanium and aluminium isopropoxides, respectively, the former a catalyst, and the latter a chemical reagent. This compound may serve as a chemical reagent in itself, by acting as a dihydrogen donor in transfer hydrogenation. Rubbing alcohol, hand sanitizer, and disinfecting pads typically contain a 60–70% solution of isopropyl alcohol in water. Water is required to open up membrane pores of bacteria, which acts as a gateway inside for isopropyl. A 75% v/v solution in water may be used as a hand sanitizer. Isopropyl alcohol is used as a water-drying aid for the prevention of otitis externa, better known as swimmer's ear. Although isopropyl alcohol can be technically used for anesthesia, its many negative drawbacks prohibit this use. Isopropyl alcohol can also be used similarly to ether as a solvent or as an anesthetic by inhaling the fumes or orally. Early uses included using the solvent as general anesthetic for small mammals and rodents by scientists and some veterinarians. However, it was soon discontinued, as many complications arose, including respiratory irritation, internal bleeding, and visual and hearing problems. In rare cases, respiratory failure leading to death in animals was observed. Isopropyl alcohol is a major ingredient in "gas dryer" fuel additives. In significant quantities, water is a problem in fuel tanks, as it separates from the gasoline, and can freeze in the supply lines at cold temperatures. Alcohol does not remove water from gasoline; rather, the alcohol solubilizes water in gasoline. Once soluble, water does not pose the same risk as insoluble water, as it will no longer accumulate in the supply lines and freeze. Isopropyl alcohol is often sold in aerosol cans as a windshield de-icer. Isopropyl alcohol is also used to remove brake fluid traces from hydraulic braking systems, so that the brake fluid (usually DOT 3, DOT 4, or mineral oil) does not contaminate the brake pads, which would result in poor braking. As a biological specimen preservative, isopropyl alcohol provides a comparatively non-toxic alternative to formaldehyde and other synthetic preservatives. Isopropyl alcohol solutions of 70–99% are used to preserve specimens. Isopropyl alcohol is often used in DNA extraction. It is added to a DNA solution in order to precipitate the DNA which then forms a 'pellet' after centrifugation. This is possible because DNA is insoluble in isopropyl alcohol. Isopropyl alcohol vapor is denser than air and is flammable, with a flammability range of between 2 and 12.7% in air. It should be kept away from heat and open flame. Isopropyl alcohol has been reported to form peroxides which may explode upon concentration. Isopropyl alcohol is a skin irritant. Isopropyl alcohol and its metabolite, acetone, act as central nervous system (CNS) depressants. Symptoms of isopropyl alcohol poisoning include flushing, headache, dizziness, CNS depression, nausea, vomiting, anesthesia, hypothermia, hypotension, shock, respiratory depression, and coma. Poisoning can occur from ingestion, inhalation, or skin absorption; therefore, well-ventilated areas and protective gloves are recommended. Around 15 g of isopropyl alcohol can have a toxic effect on a 70 kg human if left untreated. However, it is not nearly as toxic as methanol or ethylene glycol. Isopropyl alcohol does not cause an anion gap acidosis (in which a lowered blood serum pH causes depletion of bicarbonate anion) but it produces a osmolal gap between the calculated and measured osmolalities of serum, as do the other alcohols. Overdoses may cause a fruity odor on the breath as a result of its metabolism to acetone, which is further metabolized to produce the nutrients acetate and glucose. Isopropyl alcohol is oxidized to form acetone by alcohol dehydrogenase in the liver. The biological half-life of isopropyl alcohol in humans is between 2.5 and 8.0 hours. 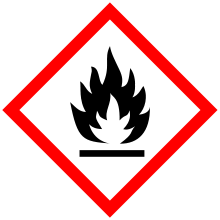 Isopropyl alcohol is denatured for certain uses, in which case the NFPA 704 rating is changed to 2,3,1. In 1920, Standard Oil first produced isopropyl alcohol by hydrating propene. Its major use at the time was not rubbing alcohol but for oxidation to acetone, whose first major use was in World War One for the preparation of the smokeless propellant, cordite. ↑ "Alcohols Rule C-201.1". Nomenclature of Organic Chemistry (The IUPAC 'Blue Book'), Sections A, B, C, D, E, F, and H. Oxford: Pergamon Press. 1979. Designations such as isopropanol, sec-butanol, and tert-butanol are incorrect because there are no hydrocarbons isopropane, sec-butane, and tert-butane to which the suffix "-ol"can be added; such names should be abandoned. Isopropyl alcohol, sec-butyl alcohol, and tert-butyl alcohol are, however, permissible (see Rule C-201.3) because the radicals isopropyl, sec-butyl, and tert-butyl do exist. ↑ Reeve, W.; Erikson, C.M. ; Aluotto, P.F. (1979). "A new method for the determination of the relative acidities of alcohols in alcoholic solutions. The nucleophilicities and competitive reactivities of alkoxides and phenoxides". Can. J. Chem. 57 (20): 2747–2754. doi:10.1139/v79-444. 1 2 Yaws, C.L. (1999). Chemical Properties Handbook. McGraw-Hill. ISBN 0-07-073401-1. 1 2 3 "Isopropyl alcohol". Immediately Dangerous to Life and Health. National Institute for Occupational Safety and Health (NIOSH). 1 2 3 "NIOSH Pocket Guide to Chemical Hazards #0359". National Institute for Occupational Safety and Health (NIOSH). ↑ Doolittle, Arthur K. (1954). The Technology of Solvents and Plasticizers. New York: John Wiley & Sons, Inc. p. 628. 1 2 3 The Merck Index (10th ed.). Rahway, NJ: Merck & Co. 1983. p. 749. ↑ Logsden, John E.; Loke, Richard A (1999). "Propyl Alcohols". In Jacqueline I., Kroschwitz. Kirk-Othmer Concise Encylclopedia of Chemical Technology, (4th ed.). New York: John Wiley & Sons, Inc. pp. 1654–1656. ISBN 978-0471419617. ↑ "Isopropyl Alcohol, UltimAR, Suitable for Liquid Chromatography, Extract/Conc, UV-Spectrophotometry". VWR International. Retrieved 25 August 2014. ↑ "UV Cutoff" (PDF). University of Toronto. Retrieved 25 August 2014. ↑ Young, W.; Hartung, W.; Crossley, F. (1936). "Reduction of Aldehydes with Aluminum Isopropoxide". J. Am. Chem. Soc. 58: 100–2. doi:10.1021/ja01292a033. ↑ Logsdon, John E.; Loke, Richard A. (December 4, 2000). "Isopropyl Alcohol". Kirk‑Othmer Encyclopedia of Chemical Technology. John Wiley & Sons, Inc.
↑ "Sodium Isopropyl Xanthate, SIPX, Xanthate". 3DChem.com. Retrieved 2012-06-17. ↑ "Guide to Local Production: WHO-recommended Handrub Formulations" (PDF). World Health Organization. August 2009. ↑ Burlage, Henry M.; Welch, H; Price, CW (2006). "Pharmaceutical applications of isopropyl alcohol II. Solubilities of local anesthetics". Journal of the American Pharmaceutical Association. 36 (1): 17–9. doi:10.1002/jps.3030360105. PMID 20285822. ↑ Society for Experimental Biology and Medicine (1922). Proceedings of the Society for Experimental Biology and Medicine, Volume 19. p. 85. 1 2 "Isopropanol". Sigma-Aldrich. 19 January 2012. Retrieved 6 July 2012. ↑ Kolar, Wes (July 11, 2000). 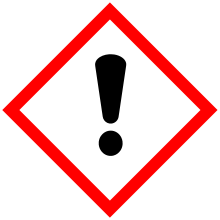 "Lab Safety Review: Danger! – Peroxides Present". 1 2 3 4 5 Slaughter RJ, Mason RW, Beasley DM, Vale JA, Schep LJ (2014). "Isopropanol poisoning". Clinical Toxicology. 52 (5): 470–8. doi:10.3109/15563650.2014.914527. PMID 24815348. ↑ Kalapos, MP (2003). "On the mammalian acetone metabolism: from chemistry to clinical implications". Biochimica et Biophysica Acta. 1621 (2): 122–39. doi:10.1016/S0304-4165(03)00051-5. PMID 12726989. ↑ Wittcoff, M.M. Green ; H.A. (2003). Organic chemistry principles and industrial practice (1. ed., 1. reprint. ed.). Weinheim: Wiley-VCH. p. 4. ISBN 3-527-30289-1.